Pilkington for Venice glass. Pilkington Optiwhite produced by the Pilkington Italia plant in Venice, is an exceptional product that is increasingly in demand across Europe. When, 18 months ago, the Venice plant restarted production, the challenge was to produce a very special glass. This recently renovated facility now produces Pilkington Optiwhite™ an extra-clear glass which, thanks to its excellent neutrality, guarantees outstanding transparency and therefore improved performance in a multitude of applications. You can’t say that glass is transparent until you’ve experienced Pilkington Optiwhite™. In architecture, where glass is often used to provide greater luminosity, the extraordinary transparency of Pilkington Optiwhite™ maximises transmission of natural light, significantly reducing the need for energy-consuming interior lighting. In furnishing, where the traditional tint of common float glass may alter colour appearance, Pilkington Optiwhite™ aesthetically enhances the objects’ true value and design – thanks to its exceptional colour neutrality. In window dressing, while the glass provides a necessary degree of protection, it is also an undesirable obstacle when viewing the objects on display. The superb transparency of the extra-clear Pilkington Optiwhite™ glass provides a clarity that enhances their presentation. In many cases, for the same reasons, it is also the best choice for museums and art galleries. What are the essential elements in the production of Pilkington Optiwhite™? To obtain this extraordinary product, numerous factors are essential: raw materials, a dedicated technology and specific quality controls. The raw materials, which must be pure, of selected quality, with a low content of iron oxides, require skilful and precise processing. This is to avoid the traditional colouring of float glass and the reduced transparency of ordinary glass. To target the colour rendering index and keep it stable during the whole production, the melting furnace must be precisely calibrated and there has to be total control of the melting process, where even slight variations can influence the final colour. Finally, in order to guarantee the absolute consistency of colour that is required by our customers, it is necessary to carry out continuous process monitoring and specific quality control on the glass in the laboratory. From 2018 the Venice plant has produced extra-clear glass for various commercial sectors in Italy and abroad. Because of its transparency and neutrality, Pilkington Optiwhite™ is appreciated everywhere. For example, it is increasingly used as a substrate for a wide range of glass for façades (solar control and thermal insulation), for interior furnishing applications, and for all projects that require high transparency. It is the glass that is coated with Pilkington OptiView™ anti-reflective coating for use in shop windows and museums to enhance goods for sale and exhibited works of art. And applications other than in building? The consistency of the colour rendering index during the different production cycles over the last 15 years has made Pilkington Optiwhite™ the reference product for all applications where colour plays an essential role. Its applications are therefore numerous. 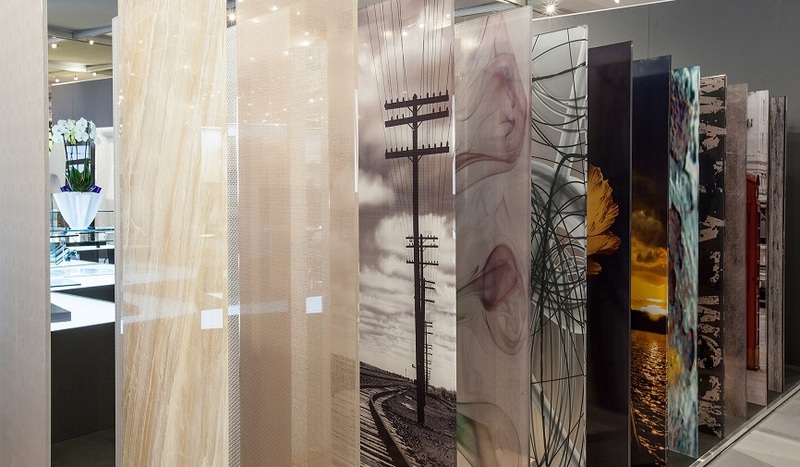 This extra-clear substrate is also widely used in the furnishing sector, where despite being enamelled or satin-finished, its aesthetic aspect remains unchanged. In the same way, through specific processes, such as screen printing or thermoforming, it is used to create a range of items, such as tables, lighting designs and bathroom furniture, and the trend is clearly growing. The NSG Group is one of the world’s leading manufacturers of glass and glazing systems in three major business areas: Automotive, Architectural and Technical Glass. Automotive serves the original equipment, aftermarket replacement, and specialized transport glazing markets. Architectural supplies glass for architectural applications, solar energy and digital signage and displays. Technical Glass products include very thin glass for displays, lenses and light guides for printers, and glass fiber, used in battery separators and engine timing belts. We have major market shares in most building and automotive product markets of the world, with a broad geographic reach, enabling us to respond to customers whose operations, particularly in the case of Automotive OE, are increasingly global. Today, NSG Group has manufacturing operations in around 30 countries on four continents and sales in some 105 countries. In the fiscal year ending 31 March 2018, the Group reported revenue of JPY 603.9 billion (approximately euro 4.65 billion). Of this, 38 per cent was generated in Europe, 27 per cent in Japan, 13 per cent in North America and 22 per cent in the rest of the world.